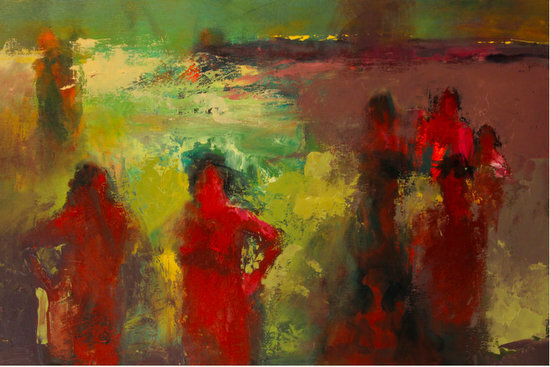 Ursula O'Farrell, "Reunion (Seascape)," 20" x 30,"oil on wood At Mythos Fine Art & Artifacts in Berkeley, co-curators Karen Zullo Sherr and Sue Steel are presenting the first of two exhibitions showcasing the works of women painters who were active in the Bay Area art scene of the 1950s. It is their hope to bring forward the achievements of women who were often "behind the scenes" in an era largely dominated by men. The show also includes the works of notable women artists who followed in subsequent generations. I recently interviewed Karen Zullo Sherr and Sue Steel and asked them about the genesis of the exhibition, and what they have learned as its curators. Can you tell me: how did this show come about? Karen: Our last show in January was about the Beat Era, Rebels, Hipsters and Visionaries, Bay Area Poets and Artists 1950's and 60's. We were surprised that there were so few women represented in the work we managed to gather for the show. We also looked at a film about the period and the women were presented as wives, girlfriends and helpers, behind the scenes. During the events for our show we presented a few films by Mary Kerr, who highlighted a number of women -- besides Joan Brown and Jay De Feo -- working during the period, and we glimpsed some beautiful lyrical painterly abstraction -- the kind of work both of us love -- and so the idea of for the show grew and we decided to track these and other women down. 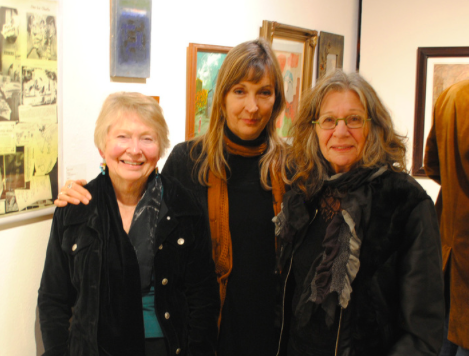 Mary Kerr, Sue Steel, Karen Zullo Sherr I am a painter and knew some local women who had influenced me, and Sue knew some too. We also got a lot of help from Deanna Forbes, a strong figurative artist of the period -- included in the show -- who put together a list for us of women to investigate. We started to collect so much work, that we have planned a second part of the show to open in September. Sue: Another key woman painter, Ariel (Parkinson), who painted during the period, was the inspiration for the original, Mythos Fine Art and Artifacts Gallery. When I first encountered her work, I thought I'd been hit by a force of nature. I started my gallery to showcase her powerful original work. 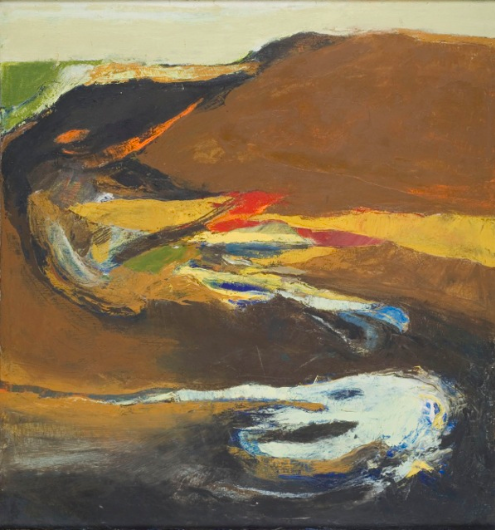 Eventually Mythos Gallery in its various incarnations began to concentrate on painters and poets of the "San Francisco Renaissance" of the 1950s and 60s (with the help of the Jess Collins Trust and Christopher Wagstaff). There were a few women: Mary Fabilli, Lyn Brockway and Madeline Gleason, who surfaced, but the painters recognized today are largely men. This show is for me a continuation of my interest in the spirit and vitality of these times in the Bay Area, both in painting and poetry. 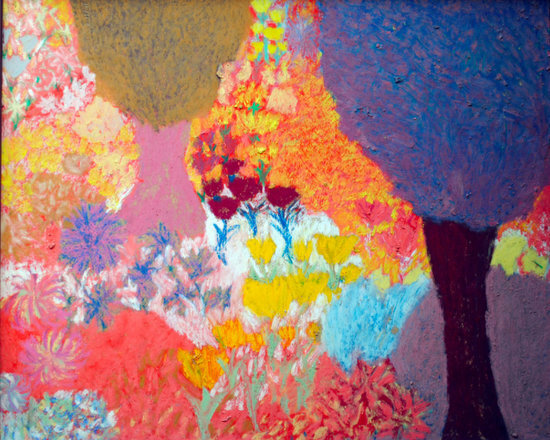 Lyn Brockway, "Wild Flowere", 1962, oil crayon on board, 31" x 37," Private Collection Why were there not more women from the 50s and 60s who became well known? Karen: There were a lot of constraints on women because of the culture of the 50s. And so I think their were not many opportunities for them to show their work and gain exposure and then experience all the give and take that comes with that process. It was hard for them to be taken seriously and also to present themselves as serious artists. We will be showing a couple of films of New York artists Grace Hartigan and Joan Mitchell, and although prominent now, they struggled to be shown and considered as good as the men. They talk about it eloquently in these films. One of the artists we visited to pick up work was married to a very well known painter of the period and said "I don't want to complain, never want to complain about what happened to me." She was talking about feeling overlooked at the time. But it is still hard for people who were raised during that time period to confront that. Sue: Some of the women artists, remained in the background because they believed that was their role and some discontinued their careers to raise families, such as Lyn Brockway. 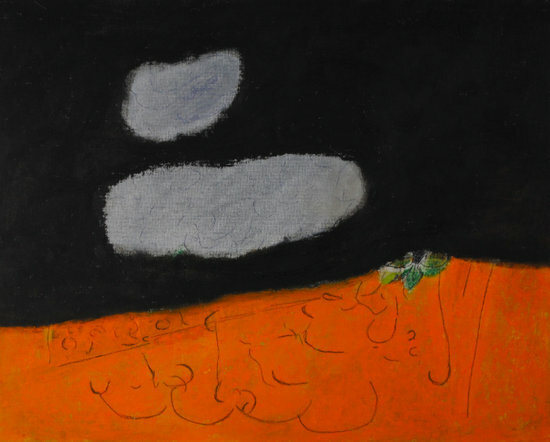 Adelie Landis Bischoff, "Orange Abstraction", oil stick on canvas board, 16" x 20" Are there any discoveries? Karen: I would not use the word discoveries because most of the women in the show have exhibited their work over the years quite a lot. But in terms of a few women I had never even heard about we are very impressed with the rich abstractions of both Ann Morency and Lynn Faus. I had known Bernice Bing (Bingo), so I was aware of her work, and the examples we have in the show are light-filled and radiant. After her death supporters have campaigned to have her work viewed more widely and that should continue. Bernice Bing, "Mayacamas No. 3", 1963, oil on canvas, 35" x 33" Although in the end we were unable to include a painting of Mary Lovelace O'Neal -- she did not have one available that fit and hope to get one for the second show -- I think her work has not gotten enough attention. Sue and I both loved the work of several women, who continue to paint in a figurative and abstract expressive way and admire greatly the brave, risk taking painting of Lisa Esherick, and younger painters Lin Fischer and Ursulla O'Farrell. A personal discovery of mine I guess is the work of Adelie Landis. I have know of her of course, but seeing more of her work I see how strong her old and her newer abstract is and we hope to show more of her work. We also want to show more of June Felter's more typical work in the next show. 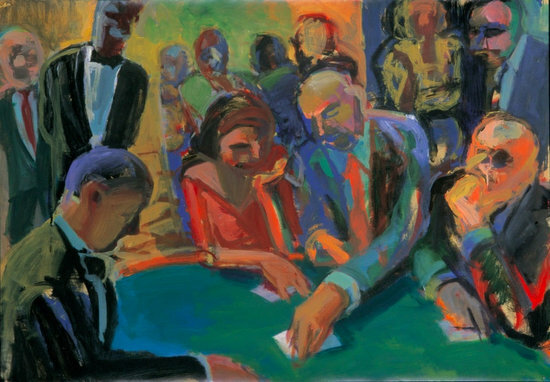 Lisa Esherick, "Poker--Stuttgart," 2001, acrylic & latex on paper, 27.5" x 39.25" Tell me about the response to the show. Karen: We have been pleased with the response. After we got it hung and had a chance to relax we thought the show beautiful and very rich. That is the response we are getting from viewers too, both from people who know about the period and others too who are not aware of the history. Many people have commented on the brilliant color and strong emotional impact of these highly charged paintings and say that the current art scene rarely seems to yield such intense passionate work. Sue: We feel heartened to bring back together several generations of women painters, many of whom were colleagues at the San Francisco Art Institute, to celebrate their work and bring them more recognition for their wonderful creations and to encourage an interest in a fascinating explosive period of art, which continues to influence young painters today. Featured Artists: Ariel, Bernice Bing, Adelie Landis Bischoff, Nell Blaine, Lyn Brockway, Lisa Esherick, Mary Fabilli, Lynn Faus, June Felter, Lilly Fenichel, Lin Fischer, Deanna Forbes, Jane Freilicher, Sonia Gechtoff, Ann Morency, Ursula O'Farrell, Mary Lovelace O'Neal, and Deborah Remington.